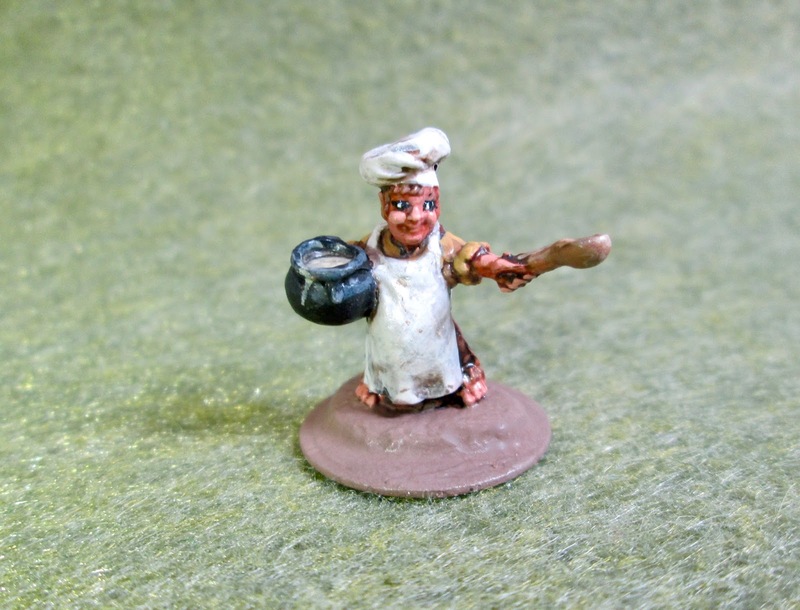 Halfling Cook: Bones 3 Figure | H.A.W.K.S. 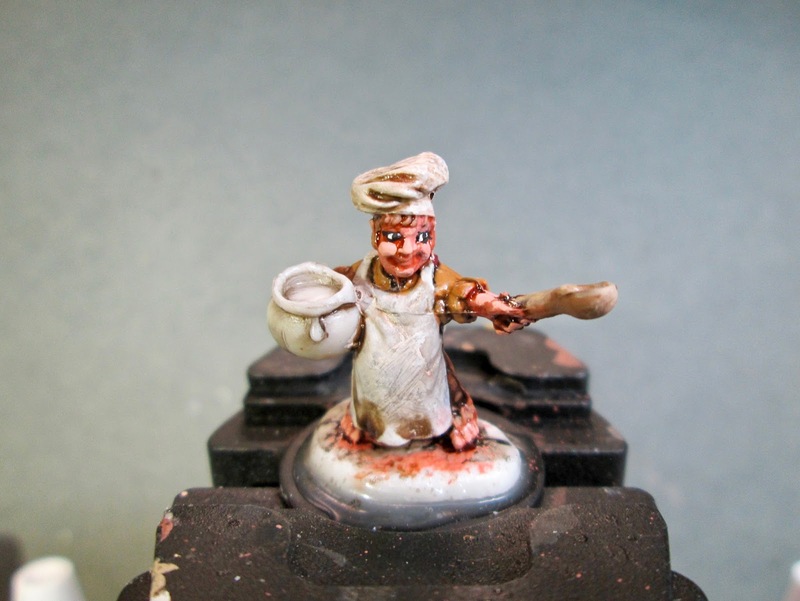 This past week I painted the Halfling Cook from the Bones 3 Townsfolk set. I began by painting his head, arms, and feet with Americana “Shading Flesh”. I then painted his shirt with Accent “Mustard Seed”, his pants with Accent “Real Umber”, and his vest with Ceramcoat “Black Cherry”. 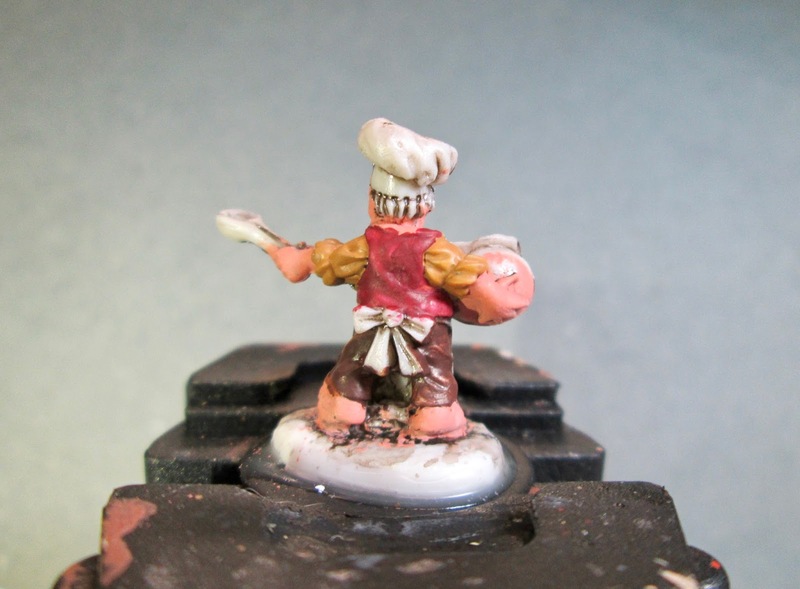 Next, I painted his apron and hat with Americana “Dove Grey”. I then did his hair with Crafter’s Edition “Spice Brown”, and his spoon with Ceramcoat “Territorial Beige”. After everything had a while to dry, I went back and went over his head and feet with a wash of Citadel “Reikland Fleshshade” wash. 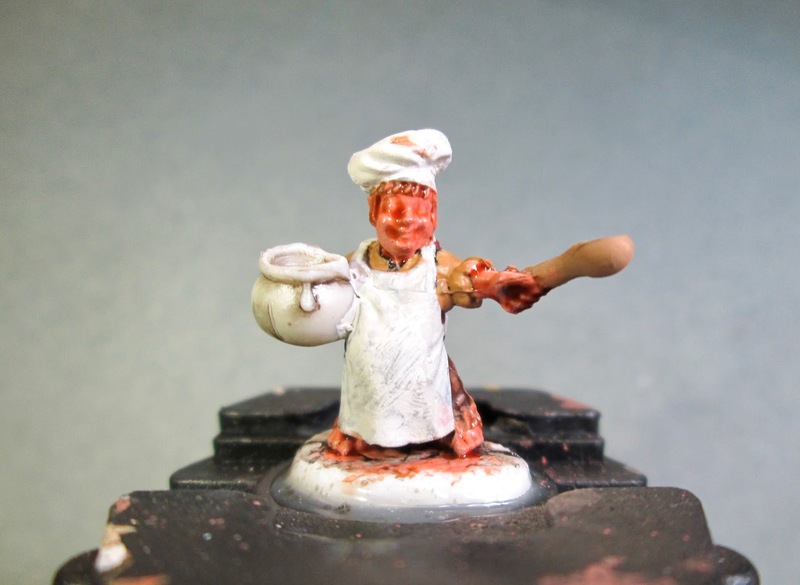 When that wash was dry, I then gave a wash to all his clothing and the spoon with Citadel “Agrax Earthshade” wash. After I let this second wash I dry, I painted his eyes, and then highlighted his skin areas with a mix of the “Shading Flesh”, and some Crafter’s Acrylic “Flesh”. Afterwards, I highlighted his hair with Americana “Sable Brown”, and the spoon with Americana “Khaki Tan”. 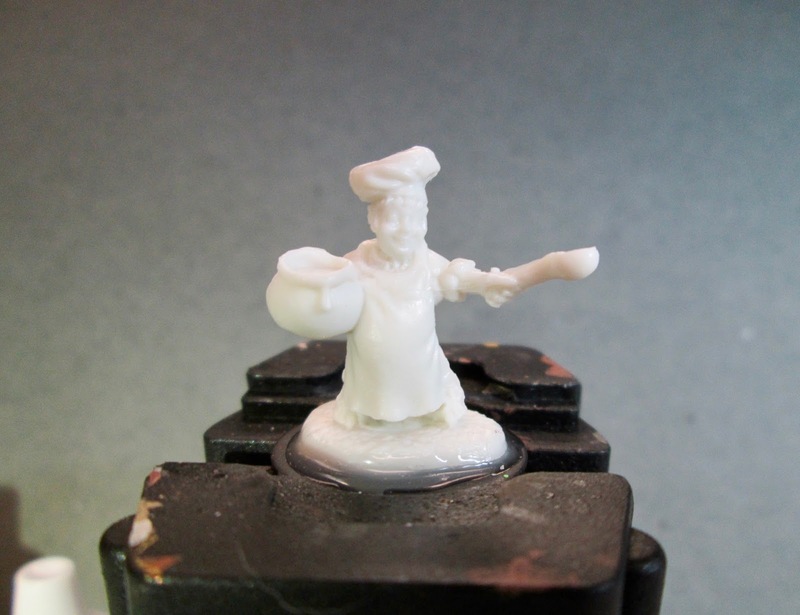 Next, I highlighted his hat and apron with a mix of the “Dove Grey”, and Americana “Snow White”. I then highlighted his shirt with a mix of the base “Mustard Seed”, and some Crafter’s Acrylic “Bright Yellow”,and then did the highlights on his vest with some Reaper MSP “Holly Berry”. I followed that with highlighting his pants with Folk Art “Teddy Bear Brown”. I then worked on the pot, painting it first Americana “Black”, and then painting the soup with Folk Art “Porcelain White”. When the “Porcelain White” was dry, I gave it a wash with some Citadel “Nuln Oil” wash. When the wash was dry, I added a few highlight dots to the soup with the base “Porcelain White”. I then highlighted the pot with some Americana “Zinc”. I finished up by painting the base with Americana “Mississippi Mud”. I let the figure sit all day, and that evening I gave it a coat of Americana “DuraClear Matte” varnish. The next afternoon I gave the figure a coat of Testor’s “Dullcote” spray varnish. A fun little figure; nothing to get excited about, but I’m pleased with how he came out. Looks great! 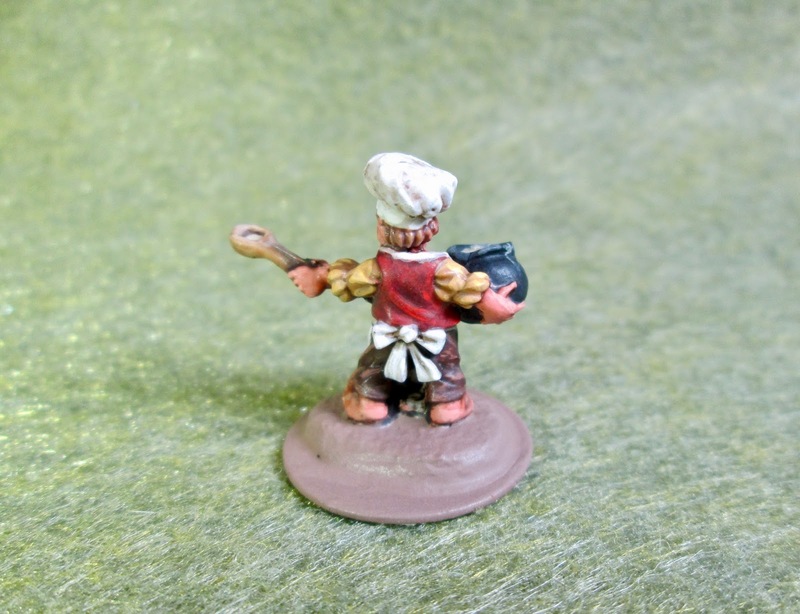 In Blood Bowl, you can purchase a “Halfling Chef” during a match to help you out. This would be a great mini for that purpose! Nice job Chris. You could use him in Frostgrave as a decoy!